Just hours after Israel appeared to scale back its demands for stopping the fighting, a new barrage of rockets fired by guerrillas in southern Lebanon hit northern Israel. 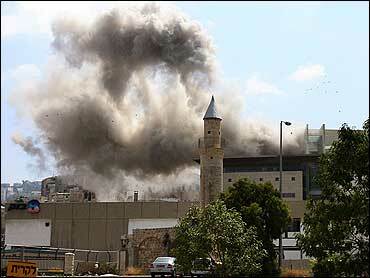 Five people are hurt after militants in Lebanon fired a rocket that hit near an Israeli hospital. Security officials also say other rockets hit the normally bustling city of Haifa. People there were already told to stay in bomb shelters after an apartment building was destroyed by another rocket earlier Monday. CBS News correspondent Charlie D'Agata reports that the six-day battles with militants has entered a dangerous new phase, as Israel confirmed that its ground troops have crossed Lebanon's border. Lebanese officials say more than 140 people have been killed — mostly civilians. Olmert told the Israeli parliament Israel will not be held hostage by terror groups. French Premier Dominique de Villepin, on a visit to Beirut, also said an end to the bloodshed in Lebanon must include the release of two captured Israeli soldiers, as well as a halt to Hezbollah and Israeli attacks. Israel had previously demanded the full dismantling of Hezbollah as a condition for ending hostilities. However, an Israeli senior official close to the negotiations said Israel would agree to Hezbollah merely leaving the border area, with the Lebanese army taking its place. "We believe that we should think of an acceptable and fair (deal) to resolve this," Iran's Foreign Minister Manouchehr Mottaki said after talks with Syrian Vice President Farouk al-Sharaa in Damascus. "In fact, there can be a cease-fire followed by a prisoner swap." "We are not looking for war or direct conflict, but if necessary we will not be frightened by it," Olmert said. British Prime Minister Tony Blair and U.N. Secretary General Kofi Annan called for the deployment of international forces. Separately, the European Union said it was considering the deployment of a peacekeeping force in Lebanon. Israel opposes the deployment of international forces because it believes it will not help the situation in Lebanon, reports Berger. Instead, Israel wants the Lebanese army to take control of South Lebanon and for Hezbollah to be disarmed. "We shall seek out every installation, hit every terrorist helping to attack Israeli citizens, destroy all the terrorist infrastructure, in every place," Olmert said. "We shall continue this until Hezbollah does the basic and fair things required of it by every civilized person," he said. "Israel will not agree to live in the shadow of the threat of missiles or rockets against its residents." As Olmert spoke, a U.N. delegation also trying to mediate and end to the fighting arrived in Israel from Beirut. "We hope that we will be able to see our way toward ... a de-escalation of the crisis," said Vijay Nambiar, head of the delegation. He said he would pass on information gathered in the Lebanese capital with Israeli officials, but declined to elaborate. "We believe that we should think of an acceptable and fair (deal) to resolve this," Iran's foreign minister said after meeting with Syrian Vice President Farouk al-Sharaa in Damascus. "In fact, there can be a cease-fire followed by a prisoner swap." "The circumstances prevailing in the region are not in the interests of the Zionist entity," he said, referring to Israel. "The attack launched by Israel was orchestrated." Although Israelis tell CBS News chief foreign correspondent Lara Logan the attacks on Haifa are like attacks on San Francisco would be to Americans, Mayor Yona Yahav tells Logan it's not unexpected. "We are patient, we are strong, and we can take it," he says. The strikes in Lebanon have been concentrated in a very small area about one square mile, reports CBS News correspondent Elizabeth Palmer in Beirut. Outside the capital, specific targets include crucial transportation links like bridges and roads, choking off normal movement. Lebanese security officials said as the death toll from the conflict rose to more than 200 — 196 in Lebanon, according to the officials, and 24 in Israel. Meanwhile, the very first American citizens were airlifted to safety Sunday night. The 21 Americans, all college students, went to Cyprus on a Marine helicopter and another small group traveled that way Monday. CBS News national security correspondent David Martin reports that 42 Americans in all were evacuated by helicopter Monday. It will be Tuesday at the earliest before large-scale evacuations can begin, reports Martin. Then, a Greek commercial vessel, the Orient Queen, with capacity to carry 750 passengers, will be under U.S. charter and available to ferry evacuees from Lebanon to Cyprus. A Greek cruise ship chartered by French government was due to arrive in Lebanon Monday to evacuate 900 French and 300 other European nationals to Cyprus, reports CBS News correspondent Elaine Cobbe in Paris. French ambassador Hadelin de la Tour du Pin said he had received assurances from Israeli government that the ship would receive safe passage to Lebanon and then to Cyprus. The evacuated students say there is anger and resentment among the Americans they left behind in Beirut, reports CBS News' Amy Guttman. They cite European nationals whose governments acted swiftly to evacuate them. Guttman says there are reports that some Americans have been told by the U.S. Embassy that they could be stuck in Beirut for as much two more weeks. Israeli officials accused Syria and Iran of providing Lebanese guerrillas with sophisticated weapons, saying the missiles that hit Haifa had greater range and heavier warheads than those Hezbollah had fired before. The United States, Israel and Lebanon are not in a good position, Michael O'Hanlon of the Brookings Institution said on CBS News' The Early Show. "Israel doesn't have the military power to stop this. It's the terrorist and insurgent movement, and it's very hard to stop this sort of thing with artillery and airplanes," O'Hanlon said. "We don't have enough influence over any of the parties, and the Lebanese government can't really reign in Hezbollah because it's not strong enough." "The world is not sure how to get out of this and is getting ready for the worst. That's why we're talking about evacuation plans of tens of thousands of people," O'Hanlon told Early Show co-anchor Harry Smith. The fighting has unified Israel society and silenced its normally constant political fighting. Speaking after Olmert, opposition leader Benjamin Netanyahu said he supported Israel's offensive. "We need to turn Hezbollah and (Hezbollah leader Sheik Hassan) Nasrallah into a symbol, not a symbol of what our enemies do to us, but a symbol of what we do to our enemies who come to attack us," he said. "From now on, the terrorists and enemies of Israel will all know, the nation is united like a fist. You don't mess with us, you don't fire rockets at us."